In compliance with regulations, I must first mention that I received Baby Shower directly from The Reading Warehouse, as part of the Goodreads "First Reads" program.Zoe is a girl with a deep longing for a pet, the type of longing with which so many kids from around the world will always be able to closely identify. When Zoe learns that her aunt Ellie is going to be having a baby shower party in expectation of her eminent bundle of joy, Zoe lends a hand to help out with the preparations for the shower, to take her mind off of not having a pet. Then something extraordinary happens. All over the place, baby animals begin to rain down from the sky, in a literal baby shower. Pet stores find a new source of stock, and zoos, parks, and locations everywhere become flooded by the new number of infant animals. One day, Zoe has the good fortune to come across one special animal that has rained down from the sky, an animal that just might become the pet that she has been waiting for from the start. Jane Breskin Zalben has a good grasp of the language of writing. This is a nice book that is sure to find appreciative young readers in many places, and I enjoyed reading it. Zoe wants a pet more than anything else. To take her mind off her pet obsession, her mother asks her if she would like to help her get ready for Aunt Ellie's baby shower. Zoey throws herself into shower preparations, and on the night before the shower, as she is falling asleep, it starts to rain babies - a baby shower! Babies of every kind - puppies, kittens, piglets, lambs... There is a surprise for Zoe after the shower, and soon after that, she's a big cousin! It's a cute story, but some things are glossed over. When you find a puppy, shouldn't you try to find the owner before you decide to keep it? The illustrations are cute. Zoe's love of animals shows in her clothing, her room decor, and her artwork. 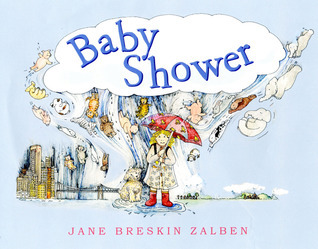 In the tradition of Cloudy with a Chance of Meatballs comes Baby Shower by Jane Breskin Zalben. Zoe wants a pet more than anything but she is talked into helpingi with the baby shower for her new cousin instead. Her excitement about being a big cousin sparks an unusual storm where it actually rains babies. Babies of all kinds and species. Like most picture books aimed at this age set 3-6, this book has a very happy ending. I thought this book was well done. The pictures perfectly complement the illustrations and make this a book to share with children who are going to be new cousins or sisters and brothers. I would recommend this book for children ages 3-6 and I think it will be enjoyed by those ages the most. Can't decide what to think of this book, so it's two star. It's pretty darn cutsey, and doesn't talk at all about the day-to-day responsibilities of having a puppy. The little kid gets off easy.Still, what's not to like about babies. 1980s cheesy illustrations. Babies raining from the sky. And the moral of the story seems to be: puppies are just like human babies and you'll get one if you ask enough. A tad too awkwardly illustrated and cutesy.